Navarrenx has the "Prettiest villages in France" seal of approval. A small, completely renovated house, in a typical local style has earned a 3-épi classification under the new rules of the 'Gîtes de France' association. It lies in a market town of an authentic, pastoral village in the Oloron mountain stream valley. Set on the borders or Béarn and the Basque Country, halfway between the sea and the mountain. We are 1.5 km away from Navarrenx city centre. Navarrenx itself is a medieval town known as the salmon fishing capital of the world and an eco-friendly holiday destination listed by the Station Verte de Vancances organisation. From September 2014, it is also among the closed, and prestigious, circle of France's prettiest villages (Plus Beaux Villages de France). The covered terrace with garden furniture and a barbecue gives onto a beautiful garden adorned with trees and flowers. It is completely fenced-in and much appreciated. A walking trail starts right on the gite's doorstep. Herds of cattle and ewes cross the village. Other highlights include the cuisine and the friendly inns with menus that come to around € 11. There are farmer's markets and stands selling fresh produce. The surrounding hills have a plethora of hiking trails. You can gaze at the Pyrenees from the stunning viewpoints. Bearn des Gaves listed as a region rich in art and history (Pays d'Art d'Histoire) by the French Culture Ministry, is the new tourist destination between Béarn and the Basque Country. Here the art of living is set back from the vast traffic networks at the heart of an unspoilt natural setting. The latest holidaymaker marvelled that time seems to stand still here in the valley of the Oloron mountain streams. There are family-run inns, farmers markets, and walking trails. Discover the festivals, markets, and concerts, as well as the summer entertainment. Recreational line-fishing; the Jurançon AOC wine route; and guided tours of the medieval sites, castles and mansions. Downhill trips on the mountain streams include rafting and kayaking the 20 km from Navarrenx to Sauveterre-de-Béarn. There are places to swim and sports to fish trout and salmon. This is a perfect place for relaxing holidays getting in touch with nature. Discover the rich history of both Béarn and the Basque Country. A family property, I inherited it from my parents, refurnished it, and made it into a holiday rental. It is has a 3-épis quality label from the Gîtes de France association. After working for 35 years as a journalist in southwestern France,I passed retirement age and dedicated myself to rural tourism creating a Pays de Gaves blog. I want to try and share my passion for Béarn and its mountain streams that I am so fond of with my guests. It fills me with pride that it has been listed as a land of art and history and that the town of Navarrenx in September 2014, was the only destination accepted by the national jury of France's prettiest villages. Since late 2014, my town of Narrenx has been included in the closed selection of Plus Beaux Villages de France (France's prettiest villages). It has been included as an eco-friendly tourist destination (Station Verte de Vacances) in Béarn des Gaves, itself officially recognised as a land rich in art and history! Navarrenx is also the world capital of salmon fishing! We invite you for delicious countryside holidays, getting back to nature. The rental gite (classified 3 épis by Gîtes de France) is a small, pretty, and comfortable Béarnaise house recently renovated in Provencal country house stlye. The covered terrace is a pleasant living area that leads to the blooming garden planted with trees and fully fenced. You can find the house in an authentic Bearnaise village set on the banks of the Oloron mountain stream It is 1.5 km from the medieval town centre of Navarrenx. 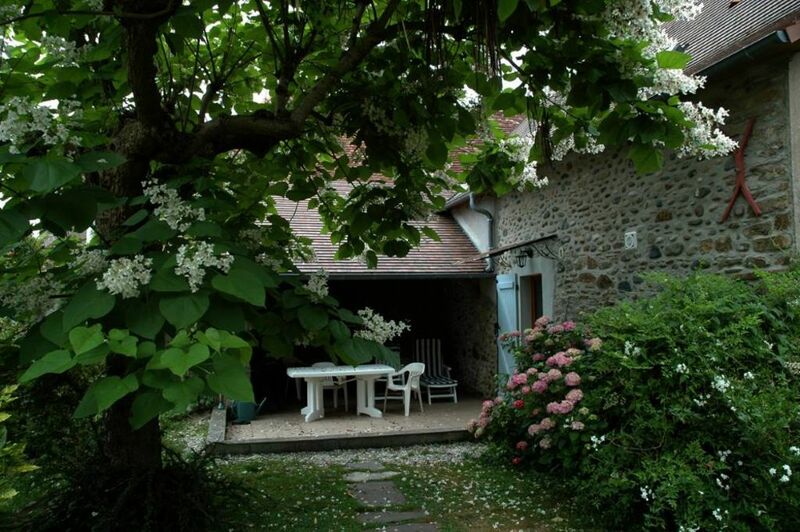 We enjoyed a 12 day stay at Gîte Sarsiat with it's beautiful garden and cosy interior. The gîte is situated just outside the lovely historic walled town of Navarrenx - a perfect base for exploring the Béarn des Gaves and the Pyrenees. The accommodation is on a very quiet side road - the main traffic was the cows being led to and back from the fields in the morning and evening. It is well furnished with good sized bedrooms and a cosy lounge. There's a nice dining area inside and also a covered dining area and BBQ outside where we ate most evenings. The owner met us on arrival and was really keen to ensure we had a comfortable stay. There was local wine, bread, water and produce from the Charcuterie in Navarrenx in our fridge on arrival. A perfect place to relax. Nous avons apprécié un séjour de 12 jours au gîte Sarsiat avec son beau jardin et son intérieur confortable. Le gîte est situé juste à l'extérieur de la charmante ville fortifiée historique de Navarrenx-un point de départ idéal pour explorer le Béarn des Gaves et les Pyrénées. L'hébergement est sur une route latérale très calme-le trafic principal était les vaches étant conduit à et en arrière des champs le matin et le soir. Il est bien meublé avec des chambres de bonne taille et un salon confortable. Il y a une belle salle à manger à l'intérieur et aussi une salle à manger couverte et barbecue à l'extérieur où nous avons mangé la plupart des soirées. Le propriétaire nous a rencontrés à l'arrivée et était vraiment désireux de s'assurer que nous avons eu un séjour confortable. Il y avait du vin local, du pain, de l'eau et des produits de la charcuterie à Navarrenx dans notre frigo à l'arrivée. Un endroit parfait pour se détendre. Even though we didn't arrive until late, Chantal was there to greet us and to show us around the cottage. M.Sarsiat had very kindly left water, wine, bread and assorted local charcuterie from the store in Navarrenx - absolutely delicious. The cottage had everything that one could hope for and is situated in a lovely tranquil corner of Jasses - the garden is beautiful and it was great to be able to sit out and relax with a glass in the evenings. M Sarsiat was charming, very helpful and went out of his way to make us feel welcome and looked after. Would definitely stay there again and fully intend to. Juste pour vous faire savoir que nous avions une belle vacances à Jasses, malgré la météo. Votre maison était très confortable et bien équipée. Nous avons fait bon usage de promenades vous livre, qui a également contesté nos compétences en traduction. Navarrenx était belle et nous avons visité les bouchers vous recommandé à plusieurs reprises. "The house had all the amenities you wished for. It was clean, comfortable and was surrounded by a lovely garden. We could walk to the lovely fortified village:Navarrenx and we enjoyed its affordable restaurants. The region is a paradise for walkers and fly-fishermen. La maison avait tout le confort qu'on puisse demander. Tout était propre et bien présenté. Le jardin qui entourait la maison était magnifique. Nous pouvions marcher jusqu'au village fortifié de Navarrenx où nous avons apprécié ses restaurants aux prix très raisonnables.La région est un paradis pour les marcheurs et les pêcheurs à la mouche." Endroit idéal pour un séjour dans le Béarn ! Gîte parfaitement fonctionnel et très bien équipé avec une petite terrasse où il fait bon prendre ses repas ainsi qu'un jardin spacieux et bien entretenu. Repos assuré avec comme unique bruit le chant des oiseaux. Le petite village de Jasses, qui touche Navarrenx est très agréable. A mi-chemin entre la côte basque et les Pyrénées, le Béarn vaut le détour et il y a tellement à faire et tant à découvrir, que pour sur, nous reviendrons, d'autant que M. Sarsiat est un hôte fort sympathique et de bons conseils. Since late 2014, the town of Narrenx has been included in the closed selection of Plus Beaux Villages de France (prettiest villages in France). It also received the Station Verte de Vacances seal of approval for environmental awareness. Navarrenx is also the world capital of salmon fishing! There is a lot to see in a 20 km radius. You can enter the romantic parks and garden of the Château de Laas that descend to meet with the river bank. Explore the medieval town of Sauveterre-de-Béarn also know as the pearl of Béarn. Experience the Salies-de-Béarn spa town with its salt waters that are 10 times saltier than seawater, its fun pool, and its fitness centre. The town of Orthez, the seat of Fébus, Lord of the Pyrenees, is a large cultural and commercial hub. The town of Oloron Sainte-Marie is a subprefecture at the gates of the Pyrenees valleys, made famous by the Tour de France. Meauléon, the capital of the Basque province of Soul and the vineyards in Monein where you can take tours of wine warehouses and tastings on the Juraçon wine route. The Basque side (Biarritz, Saint-Jean-de-Luz, Bayonne) is a 1-hour drive, as is the Landaise side (Hossegor, Capbreton), and Saint-Jean-Pied-de-Port and the Spanish border. We invite you for delicious countryside holidays and getting in touch with nature in a region rich with tradition and culture.